Yes, Cocoa NIBS, not Cocoa NIPS. We will have no mention of nip nip’s here! 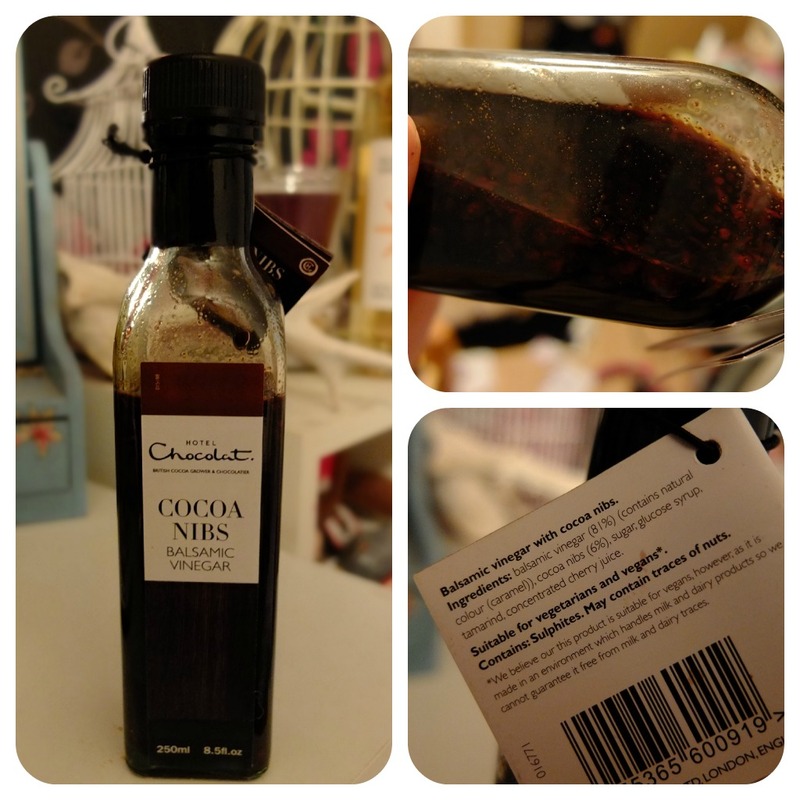 I got this Hotel Chocolat Cocoa Nibs Balsamic Dressing for my birthday back in November. Pretty weird birthday present really, but it was from my brother so I expect nothing else! He knows I am partial to odd combinations of food and enjoy eating a little more than I should. I must admit, when someone asked me what I had for my birthday and I replied a bottle of vinegar they did have a little ‘awwlol’ at my expense haha. Although I do love a good peruse of Hotel Chocolat, I didn’t ever notice this on my travels so was quite excited to try it. I’m not the greatest lover of sweet things so to find a kind of savoury treat in there was pretty awesome to say the least. I have tried several flavours of Balsamic Vinegars and Salad Dressings before so wasn’t expecting my taste buds to be wowed by pastures new by any extent, so I whipped up a salad similar to this one I made in the summer (minus the watermelon) and drizzled my heart out. The smell of this is pretty potent, it almost made my eyes water! But the taste is a lot more subtle. I was expecting a stronger flavour from the cocoa nibs too if I’m completely honest. There was no taste of chocolate and kind of threw the novelty of the vinegar away slightly, as all I get when eating anything with this in is just hard little bits stuck in my teeth! Although the Hotel Chocolat website description says that the vinegar tenderises the nibs? Maybe I got a dud bottle? I would of really like this to have been a chocolate flavoured balsamic glaze, but it’s just like the vinegar has preserved the cocoa nibs and made them a little pointless? Saying this though the balsamic vinegar itself is a lovely, quality kind and doesn’t go a miss in a salad or two. Roll on summer so I can have it on every salady meal. Yum.